The Department of Higher Education and Training (DHET) distinguishes between higher education and further education – however, both of these can lead to a career. Higher Education, according to Department of Higher Education and Training (DHET), refers to “all learning programmes that lead to qualifications which meet the requirements of the Higher Education Qualifications Sub-framework (HEQSF) of the National Qualifications Framework (NQF)”. Trade and occupations (workplace learning and skills development programmes such as learnerships and apprenticeships). 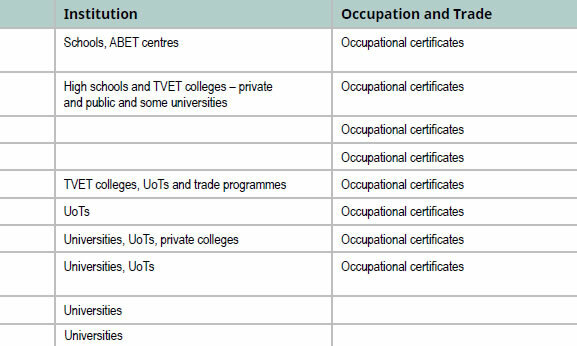 The whole system divides qualifications into levels from 1-10, with 10 being the highest level. Simply put, higher education is considered anything past Grade 12 in the levels 5-10. You will need to understand the levels in order to decide what and where to study further. Tertiary education (outside of traditional schools) can be divided in two sectors: public and private. Your choice of institution will affect the type of qualification you will obtain. Public institutions comprise traditional universities, comprehensive universities and universities of technology as well as Technical and Vocational Education and Training (TVET, previously FET) colleges. Offer academic programmes that are more theoretical in nature. The qualifications you can get here are highly respected and include undergraduate degrees, postgraduate degrees, higher diplomas and certificates. A typical undergraduate degree takes three years after which you can study further to specialise in a field (with emphasis on research). There is usually a time-frame in which a qualification needs to be achieved. 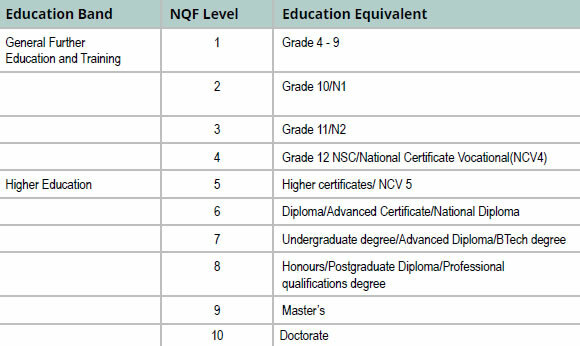 Their qualifications are all higher up on the NQF level framework (Levels 7-10). You will need to meet certain entrance requirements to attend which vary from university to university and from course to course. Offer both academic and careeroriented studies – degrees, national diplomas and advanced certificates. Offer vocation-based degrees in technology, diplomas and certificates. Requirements vary but are not as stringent as for universities. There is emphasis on work-related and practical learning. They often have Work Integrated Learning (WiL) programmes which integrates academic learning with its application in a real workplace. TVET (formerly FET) refers to education and training provided from Grades 10-12 and above including career-oriented education and training offered in technical colleges, community colleges and private colleges. Offer training to work in technical or vocational fields and students generally qualify with a certificate and can enter the world of work with practical knowledge. A certificate could gain one entry into a UoT, depending on course studied. Private institutions offer a wide variety of qualifications from degrees to certificates and often specialise in a certain area such as design or marketing. The distinction between higher education and further education and training is not as obvious here as it is in state institutions and thus they often offer qualifications across the NQF levels. While they often offer a more flexible approach to learning, it is vital to understand how their courses are accredited and where on the NQF table their courses lie. Be absolutely sure that they are registered with the DHET and accredited by the Council of Higher Education (CHE) and that their programmes are registered with the South African Qualifications Authority (SAQA). Institutions should be able to provide you with SAQA NQF identity numbers. Private institutions range from excellent to below par. The best ones are those that specialise in certain areas and have developed good relationships with industry players to design programmes that respond the world of work. Private institutions can be preferred by certain companies and industries. These are mostly private institutions, with UNISA being the obvious exception. They allow students to study in their own time and pace from home. Course materials are sent/provided online and students then complete their courses on their own. Some offer blended learning and require students to attend blocks of lectures or seminars. Examinations, however, are usually held at specific venues which students will need to make provision for.